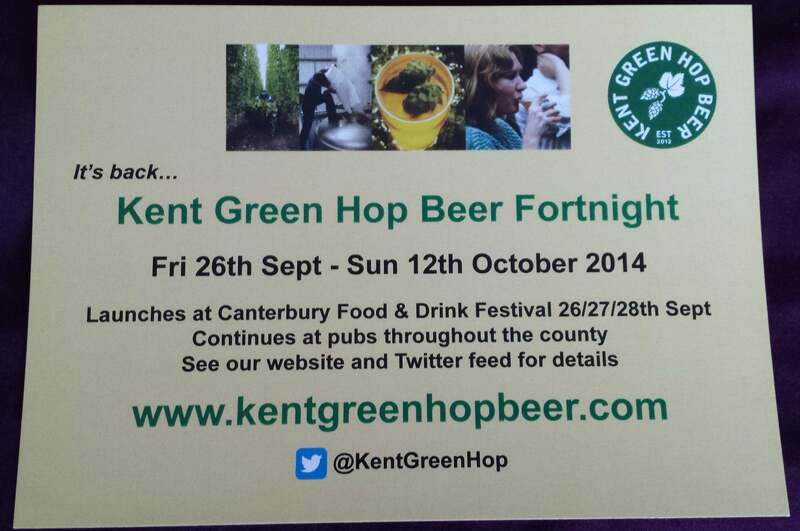 Kent Green Hop Beer Fortnight returns! When you run a once-a-year event, especially an intrinsically seasonal one like Kent Green Hop Beer Fortnight, it can be hard to keep ‘fans’ (if we may call you that?!) up-to-date throughout the rest of the year because there’s not much going on to tell you about. But if you’re worrying, or perhaps you’ve even got a little bit cross not to have heard from us sooner (sorry), let us confirm that Kent Green Hop Beer Fortnight 2014 is very much on its way! So, stay tuned, keep your ears and eyes open … we’ll be bringing you news of what to expect this year, where you’ll be able to drink Kent Green Hop Beer, who’s brewing it (some new names and faces have joined the KGHB family) and what they’re making as soon as we can. When’s that? Look out for the first of a series of ‘meet the brewer’ posts and hop news during the week commencing Mon 18th Aug and regular updates thereafter up to, and during, the Fortnight. We’re looking forward to it as much as you are. It’s going to be delicious!